My sis is a pretty cool chick. She's hip with the groovy news. A cool girl needs a cool quilt, and this is as cool as it gets for me. The center circle block is one block from Denyse Schmidt's "Single Girl" quilt that I love oh-so much. It's scrappy with some delicious fussy cutting in there - some birds, Sleeping Beauty, Alice in Wonderland, a sensible pear for a well-balanced quilt. You know, the works. The background fabric is Essex Linen in Flax. It's fairly delightful, I won't lie. I'll be using this again and again. This linen is a godsend for backgrounds in my opinion. Very snuggly, too. 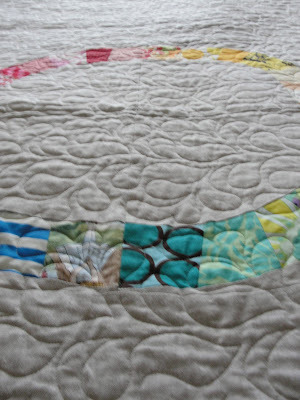 The quilting was done by my sweet mom in an all-over feather pattern. Very simple and modern, but a fairly dense design which is what I wanted for all the negative space. There not a ton of piecing in this quilt at all, obviously - just 1 real block! But I think you get a lot of bang for your buck with the flax background. Maybe just me, but I really like the effect. I was just a hair behind on these Christmas projects, so this quilt got wrapped up with the binding only halfway on. It was finished soon after Christmas was over, though, so no worries, right? And sis was snuggled up in it before I could finish binding, so I think she liked it! Bahahahaha!!!!!! I would demand a quilt as a requirement of forgiveness for SURE! i love my quillllltttt! i snuggle in it every night when i get home from work :) thank you! PS "hip with the groovy news" is the nicest thing anyone has ever said about me. ever. 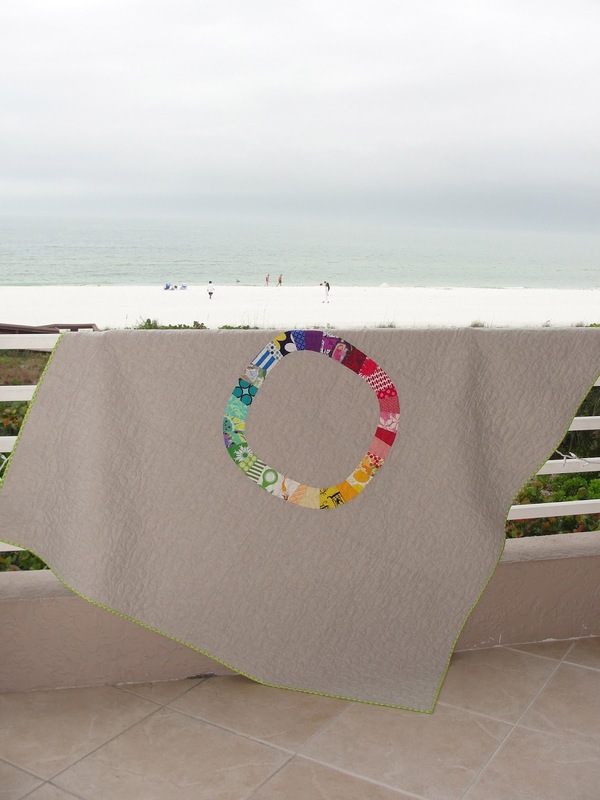 I love this quilt, Kelly!! Great job Kelly! I've never worked with the Essex linen, but you may have convinced me to give it a go. 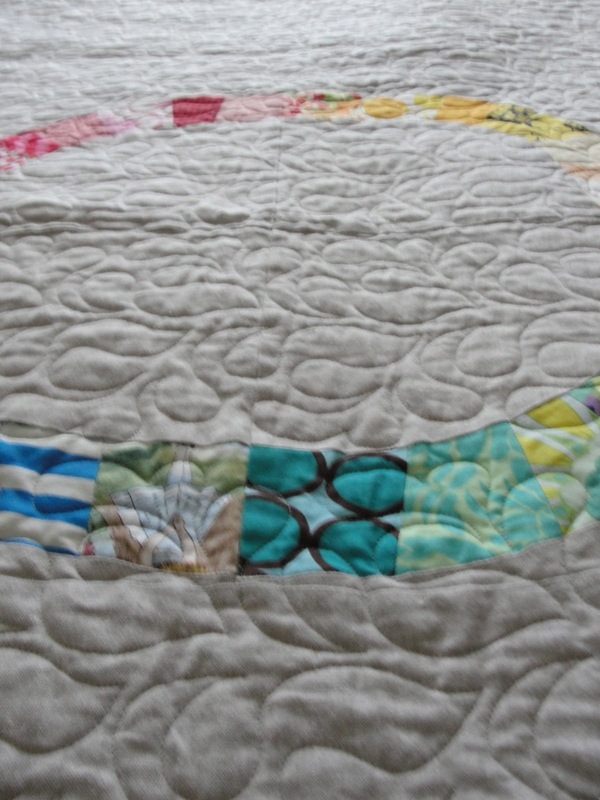 Your mom's quilting is amazing, too. LOVE this. Karen's a lucky girl. KELLY! this is extremely fabulous. I love everything about it. I love the linen. Is this the yarn dyed linen or the "regular" linen in flax?